Day 1: USA - Rome. Transatlantic overnight flight to Rome. Dinner and breakfast will be served on board. Arrival at Rome airport where you will be met and transferred to your hotel. Rest of the day is at leisure. Overnight at the hotel. After breakfast morning city tour. Visit Basilica of St Peter Basilica, the largest church in the Christian world, built over the tomb of St.Peter, than continue to Roman Forum, with stop at the Colosseum, Trevi Fountain, the Pantheon, and Piazza Navona, built on the ruins of the Domitian's Circus. Free afternoon for shopping or take optional tour Imperial Rome. Overnight at the Hotel President . Day 4: Rome- Naples- Pompeii - Sorrento. Airport transfers for passengers on UWC flights. Accommodation in hotels with breakfast daily as per itinerary or similar. Transportation Rome-Sorrento-Rome by private deluxe motorcoach. Visit Castelo Romano Designer Outlet Mall. Dinner in hotel in Sorrento. Dinner in Sorrento in local Restaurants. Dinner in Rome in local Restaurant. Service of local guide in Rome & Sorrento. Hotel service charges and tourist tax. After breakfast free day to explore this beautiful town or take optional tour (transfer to port of Sorrento to board the hydrofoil) to the Isle of Capri. Visit Gardens of Augustus, then continue by minibus to Anacapri, the highest village on the island with spectacular views. Afternoon return to Sorrento for dinner in local Restaurant. Day 6: Sorrento - Positano - Amalfi - Ravello. After breakfast excursion to Positano, brief stop at the Belvedere and continue to Amalfi, the first Roman Sea Republic of Italy. 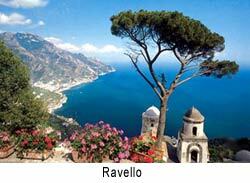 After guided walking tour of old town we continue to Ravello. Here guided tour includes medieval Villa Rufolo, with tropical gardens and San Pantaleone Cathedral. Afternoon return to Sorrento for overnight. Day 7: Sorrento- Monte Cassino - Rome. Morning drive passing the Abbey of Monte Cassino, founded in 529 completely destroyed in 1944 and reconstructed. Continue to Rome. Day 8: Rome - USA.